GERD (Gastroesophageal Reflux Disease) affects an estimated 20 percent of the U.S. population — and finding effective treatment options is more important than ever. Did you know that many people are able to control their symptoms just through dietary changes, which may also reduce their need for medication? While the world observes GERD Awareness Week, this could be the perfect time to consult your doctor for advice on the treatment alternatives that are best for you. This event is listed in the U.S. National Health Observances calendar. Its mission is "to inform, assist, and support people affected by gastrointestinal (GI) disorders." American gastroenterologist Asher Winkelstein ​first described the condition , although symptoms appeared in medical records dating back to 1925. Dr. John Macintyre, a Scottish doctor who specialized in investigation of the larynx, developed the self-illuminated endoscope at Glasgow Royal Infirmary in Scotland (which was also one of the first hospitals to have electricity).​ Today, upper endoscopy is a common procedure used to diagnose GERD and related conditions. Generally, the foods to avoid are the ones that are high in acid or caffeine, like citrus fruits, cranberries, coffee, chocolate, peppermint, and spicy foods. But that still leaves plenty of delicious options! Try simplifying a little. French cuisine, for example, is based on the concept of starting with the highest-quality ingredients, and using cooking techniques that enhance the flavor of those ingredients. Roasting a whole chicken that's been stuffed with fresh herbs is a classic of French cooking, and would be a perfect centerpiece for a GERD-friendly feast. Even though it's a little early for resolutions, there's no time like the present for committing to healthy eating habits — a little at a time. Drink just a little less coffee, for example, then perhaps try moderating the amount of heat-producing spices when you cook. And simply reducing the overall quantity of food you take in at each meal can make a difference, as will eating more slowly, which in itself has been proven to aid digestion. Hint: If you're having trouble slowing down, try focusing only on your food (i.e. no multi-tasking while you eat). Giving yourself at least two hours between eating dinner and going to bed can significantly reduce the possibility of heartburn — and eating slowly helps even more. If you think there's a possibility you may have GERD or a related condition, keeping a record of your symptoms, including what you eat and drink, sleep issues, and days and times of symptoms, will help your doctor tremendously in giving you an accurate diagnosis. 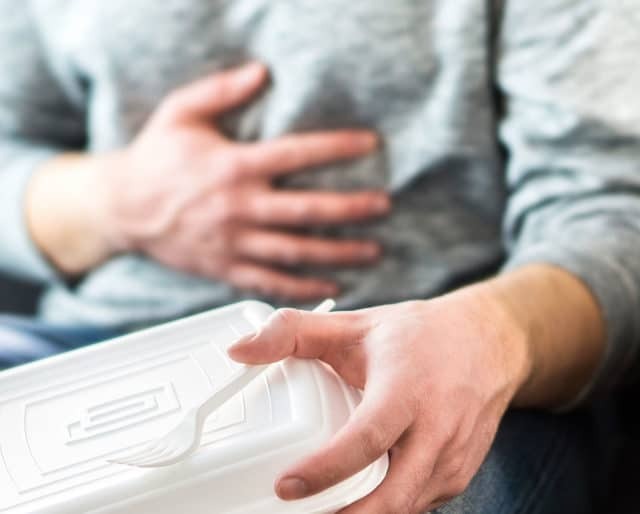 If you've never heard of GERD (which is related to acid reflux disease), you may be suffering from it without realizing it. Without treatment, over time, it's possible for GERD to lead to precancerous conditions. And even if you're perfectly healthy yourself, knowing more about GERD may help you recognize symptoms in a friend or family member, and encourage them to seek medical attention. Even if you've never had any symptoms of GERD, it's possible to trigger an episode by over-indulging in food and drinks that are highly acidic. This week is a great time to educate yourself and your family about the role your diet plays in this disease; it's not about depriving yourself, but more about learning how to enjoy treats in moderation, to help prevent GERD and related conditions. By learning about the foods and beverages that can help support a healthier gastrointestinal system, it may be possible to not just control your GERD symptoms, but to heal your body over time. (This may not apply in everyone's situation; be sure to talk with your own doctor about all possible treatment options that would be appropriate for you.) Making dietary changes does take commitment, but it's for a good cause: helping you enjoy your life to the fullest.